West Coast Catholic: White House HHS Compromise: U.S. Bishops "Unacceptable!...Must Recind Mandate""
White House HHS Compromise: U.S. Bishops "Unacceptable!...Must Recind Mandate""
I didn't figure the Bishops to respond so quickly, however I'm pleased they're not being shy on this matter. Sometimes it takes them awhile to come out with any type of response especially as one voice. Cardinal Dolan's response is much welcomed. Reading their official response, one statement by the Bishops popped out at me. "We just received information about this proposal for the first time this morning; we were not consulted in advance. Some information we have is in writing and some is oral"
After just hearing a re-cap of the announcement by president Obama on cable, it sounded like all were at the negotiating table working together. One would think that with the first meeting with Cardinal Dolan that he would be there or at least other high ranking church officials would be apart of the talks. It doesn't appear so. It more appears that the White House was not approaching this from a good faith standpoint. They were not serious about working with the faithful in resolving this at all. They were looking to having their cake (Mandate) and eating it too...and still making the faithful pay for the cake. With this quick response from the bishiop's I'm hoping that the WH is realizing that we are not going to go away and we refuse to be mislead. This Mandate is not just about Catholic institutions paying for contraception, abortifacients, but it's also faithful individual Catholics footing the bill to pay for this through our personal health insurance premiums. All faithful Catholics need to be worried about this and should react appropriately against this in the strongest terms. I'm still hoping that we will hear about this at our pupit for Sunday mass. 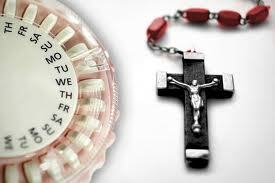 We still need the Bishops voice in the form of a letter (or video) expressing the Churches stand AGAINST this HHS mandate and contraception.